In addition to being heartless, the boss also must not have been knowledgeable about employment law, because refusing to allow the employee to care for her son under these circumstances would probably be a violation of the Family and Medical Leave Act (FMLA). The FMLA requires employers to provide employees up to 12 weeks of unpaid leave for medical or family emergencies. Some family or medical emergencies that entitle an employee to 12 weeks of unpaid leave include: a serious illness or injury to the employee or one of the employee’s family members (defined as a spouse, parent, or child under 18), the birth or adoption of a child, a planned medical procedure, or the military deployment of a family member. Only employees who have worked 12 months or 1,250 hours are entitled to FMLA leave, and only employers with at least 50 employees must provide it. I’m sure that being on life support counts as a medical emergency, so assuming the child was under 18 and the employee had been employed for at least 12 months, the boss would have been required by law to give the employee unpaid time off to care for her son. 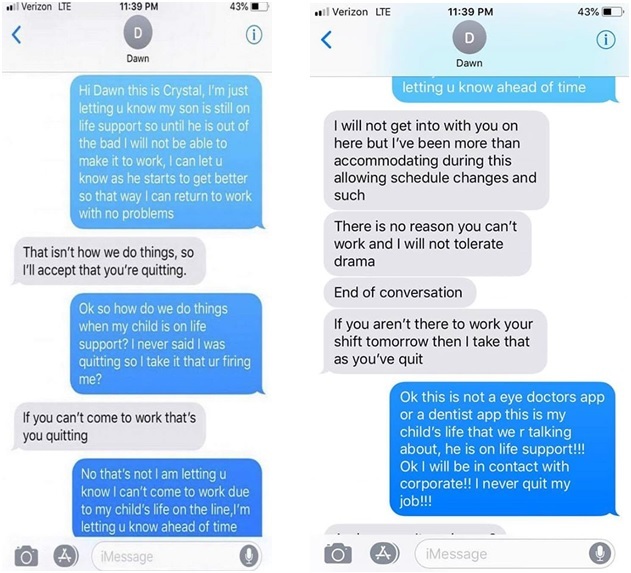 Luckily, after the employee’s Facebook post went viral, the corporation which employed the boss and her employee did the right thing and fired the boss and let the employee have as much time off as she needed to care for her son. So, the lesson for employers is a) if your employee has a child on life support, give them time off from work, and b) remember that the FMLA requires employers to give employees unpaid time off to care for any family member who has a serious medical condition. Feel free to contact me if you have any questions about the FMLA.